Symbol: A bouquet of solid green flowers in front of a white crescent moon. Occupation: Sparring teacher for years 1-4 at Beacon Academy and assistant to the headmaster. Appearance: 6’3” 172 lbs. Titania has golden-blonde hair with streaks of grey in it, which reaches down slightly past her shoulders, and a set of dark amber eyes. She is commonly seen with a large pink and white flower in her hair on the right side of her head. She, being born in Northern Vale, has a milky-white skin tone. Her usual attire consists of a light-green dress accented by red highlights over a simple white dress. The neck of the dresses extends upward about halfway up her neck and is accented by the red ascot she wears. She also wears a small half-cape extending down to slightly past her hips. The outside of the cape is the same red as the highlights and ascot and the inside is a golden yellow color. Around her waist she wears a thin brown belt with a silver buckle and several pouches hung on the right side of her hip, filled with secure dust canisters, and her sword and scabbard on her left side of her hips. History: Titania was born to the north of Vale, on the northern coast of Vytal. Due to being born outside of the Kingdom, she had to learn to fight at a very young age and was forced to help her mother and father defend her small village with very crude and primitive iron weapons. Thankfully for Titania, however, the pattern of fighting for her and her village’s life, barely surviving, and trying to keep everyone happy led to both her upbeat personality and her discovering her semblance very early in her life. Unfortunately, good luck didn’t last forever for Titania and during one of the Grimm attacks, the left defense fell, leaving the Grimm to flood into the rest of the village and kill all inside. While the rest of the village fell, Titania’s father stayed behind to distract the Grimm while Titania and her mother escaped toward the beach. In his dying act, her father was able to send up the single emergency flare into the sky to alert any and all nearby humans or faunas to send help. As it happened, a first year team was shadowing a Hunter who was tasked with eliminating a large Grimm near the village. Upon seeing the flare, the group rushed to the source. When they arrived, however, the village was deserted and all inhabitants had been killed, except for a pair of footprints leading away from the village. When they found the end of the footprints, they discovered young Titania, holding two iron swords, one large and the other small, sitting next to the corpse of her mother, who had bled out after fighting off an alpha Beowolf. The group took the girl and led her back to the City of Vale to be put into an orphanage for the next few years. Titania denied, however, and instead wished to be put into Signal Academy so that she may prevent what happened to her from happening to others. Throughout the years at signal, she was noted for having a surprisingly upbeat attitude and an air of friendliness about her. After graduating from Signal and being accepted into Beacon, she was placed on her team, all of whom would one day be professors at Beacon, and began her training immediately. 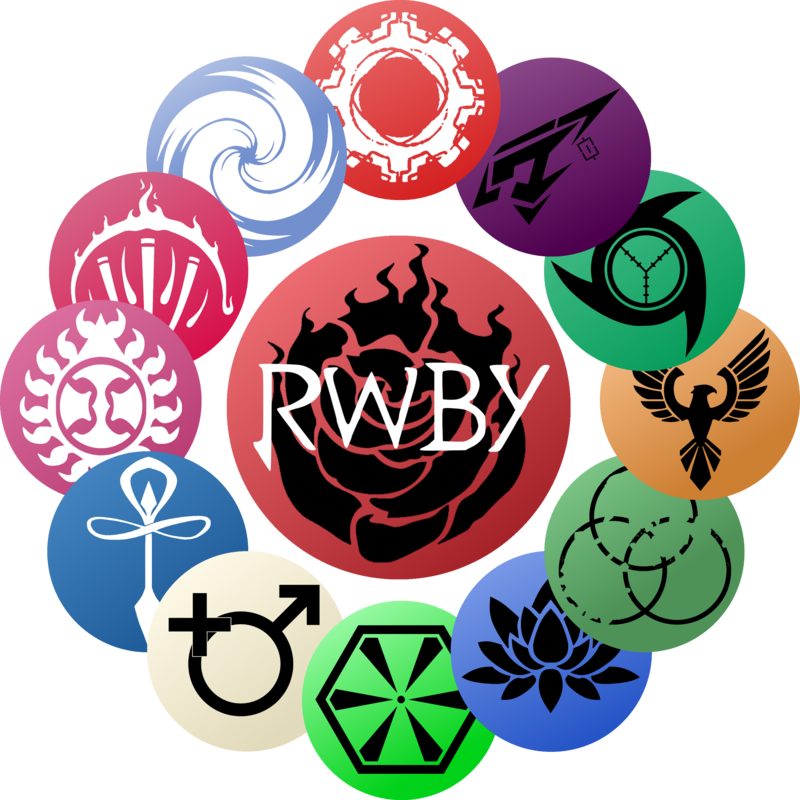 Through the years of pain, struggle, happiness, heartbreak, strange events, and triumphs, Titania kept her kind personality with her and be a beacon of friendship to everyone. She graduated near the top of her class, along with the rest of her team, and as such was awarded the honor of visiting each of the four Kingdoms. With a heartfelt goodbye, she left her teammates and moved to Mistral for many years. While in Mistral, she acquired something of a longing, not just for her teammates or for Vale, but for Beacon. During their fifth year apart, her old team met up in Vale as a reunion. They all made the decision to become teachers at the school that had taught them so that they could train the next generation of protectors. And everything from then to now is, as they say, history. Personality: Titania is, usually, a kind woman. She treats her students and others with the respect they deserve unless they do something that would take away that respect. She does enjoy being around and conversing with other people, teachers, students, humans and faunas all alike. In the classroom, she is much less kind, not strict or mean, but she does treat the classroom as a place of learning that must have a certain decorum present while in it. After years and years of training and becoming one of the longest lasting teachers in Beacon, she has learned to be patient with students and coworkers alike. One thing she does not tolerate is discrimination or hate among the students while in the classroom. While she views outside of the classroom as a place to be able to express your views freely, even hateful ones, she will punish any who try to insult another student before or after the match. Though she is kind to all of her coworkers on the outside, there are those among them whom she dislikes as well as some she likes more than most. 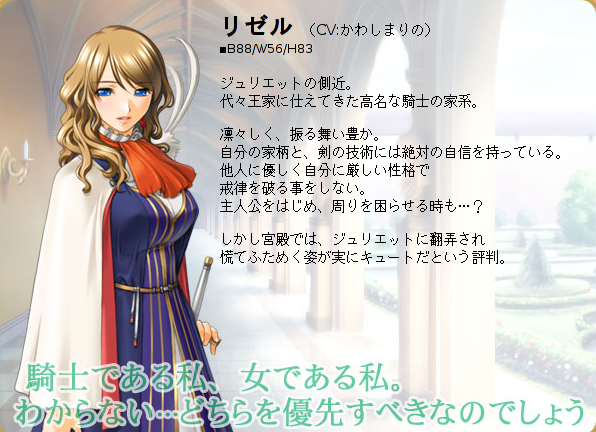 Her original team, for example, she treats as close as family, especially Alban, who was her leader back in the day. Though she does try to act kind to those she dislikes, there are times when she needs to act stern with them and will if need be. - If Dust is taken away from her, she is almost as weak as a student. Aura and Semblance: Dust Manipulation - Titania's semblance allows her aura to resonate so well with dust that she nearly has complete control over it. When she is a 30 meter range of any form of dust, her aura connects with it automatically and with little tax on her aura use. When presented with powder dust, she can cause it to float freely, controlled by the movement of aura, cause it to activate remotely, and even stop it from activating altogether. When presented with the crystal form of dust, she can only start a reaction and stop a reaction. When in the presence of one whose aura is weaker than her own, which is likely, she can control their own dust even if it is protected inside of containers of a weapon. 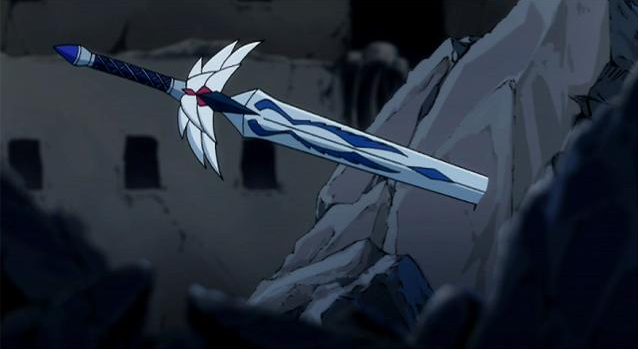 Primary Form: Midsummer's Respite, or its shorthand name, "Summer", is a single form, one-handed sword. Starting from the bottom, the pommel of the hilt is actually a multi-dust chamber compartment. The pommel fold open and a small canister of dust is inserted into one of the six total slots inside the hilt and the pommel folds shut. Once inside, a mechanism in the hilt will puncture the top of one of the canisters and start to cycle the dust throughout the sword through canals in the metal, allowing it to exit through tiny pores on certain areas of the blade, this allows the blade to take on the element of the dust that was inserted (Examples: Fire Sword, Ice Sword, Lightning Sword). Alternatively, Titania can use her semblance to control the dust flow and causing it to exit the pores without activating. This allows her to either weave the dust through the air and use it as a proximity weapon or discretely put it on opponents before activating it remotely. Titania can. likewise, fire dust missiles at a long range to achieve more versatility in battle. 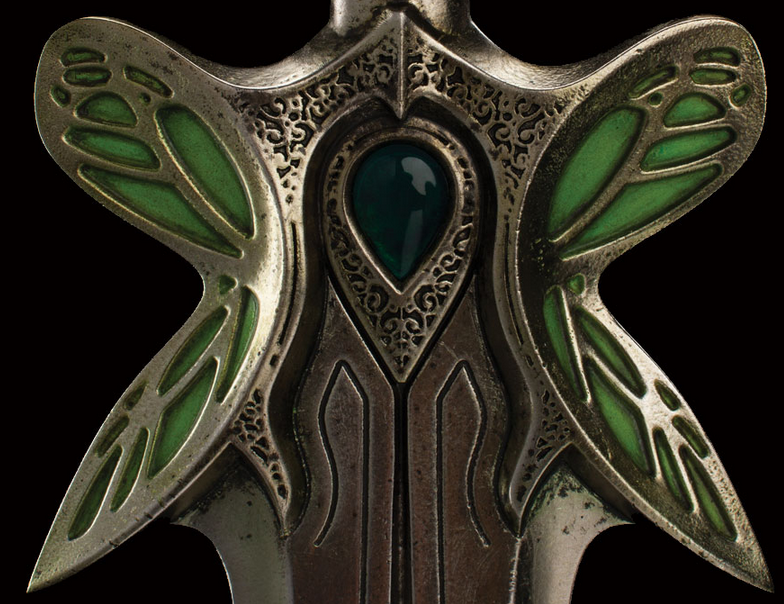 The exist pores are all located in areas of the blade that are colored such as the symmetrical set of bird wings on the base of the blade, the diamond shape at the center of the blade, and the tip of the blade which are all colored green. The hilt is a green colored metal adorned with golden V's that wrap around the hilt to help grip. The cross-guard is two symmetrical, green butterfly wings with golden highlights(similar to this). History: Titania had originally created a somewhat simple staff, Oberon's Regret, that similarly expelled dust for her to use her semblance on for combat. However, during a mission in her fourth year, the staff was snapped in two by a rogue hunter that her team had been tasked with taking down. Once the mission was complete, Titania spent days in the Beacon workshop creating this weapon and has used it faithfully ever since.